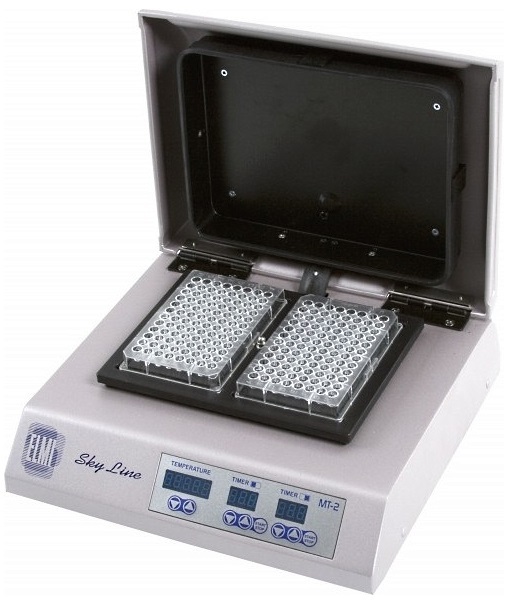 The Elmi Digitally Controlled Thermostatic Microplate Heater MT-2 features heating in both the platform and the lid, heating the whole volume uniformly and accurately. The advanced double heating system together with the hermitic aluminum container and digital platinum sensors allow very high heating accuracy. User friendly controls integrate the MT-2 easily into various incubating and other laboratory applications. All of the elements are specially designed for daily hard-duty, long-lasting operation. For heaters with shaking features in addition consider the Elmi DTS-2 or the Elmi DTS-4.